Designed for education and trusted by more than 4,000 schools in the UK, InVentry Sign in Systems are fully equipped with a Managed Information System (MIS) integrated solution that allows you to accurately monitor who is in school at any one time. More recently adopted by businesses, InVentry speeds up the sign in process and keeps identity information secure, leaving schools’ and businesses feeling confident that their pupils and staff are where they should be and are safe. 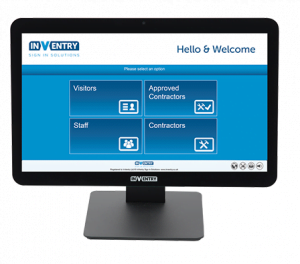 The standard InVentry system includes everything you could possibly require for an all-inclusive visitor, student and staff management system. Access a complete list of onsite visitors, check a visitor’s DBS status or track an individual student / employees lateness record, all with the touch of a button. The state-of the-art console gives receptionists and administrators full access to the visitor and staff database. Database searches, printing visitor reports and fully managing the system can be completed quickly and easily. Offering SIMS integration, means that morning registration for schools is no longer a long-winded process, instead, as soon as a pupil signs in, the SIMS system is updated automatically. 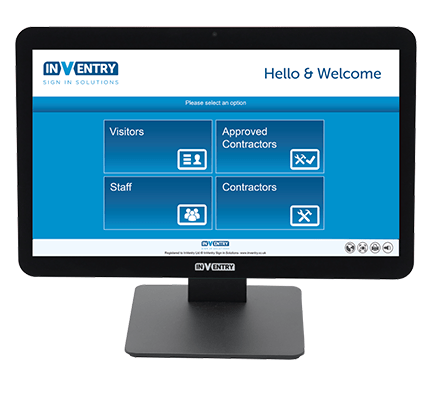 The robust but responsive touch screen gives a modern, professional look to your reception or entrance area. The integrated webcam allows you take instant photos of visitors to create both temporary and permanent ID cards. A thermal label printer works in tandem with your system, allowing you to print off visitor labels in seconds with the minimum of fuss. Plus, without the need to replace expensive ink cartridges, you will save on costs in the long run. InVentry certified technicians will make sure that your InVentry sign in system is properly installed, tested and that the InVentry software is configured to suit your operations, and will provide relevant staff members with comprehensive training. InVentry provides the ability to pre-book visitors into the school or business for events such as parents’ evening or exhibitions. Visitors will then be able to print barcoded passes to reduce wasted time at the event. Historically, event co-ordinators would spend time printing each individual badge, putting it into a badge holder and then have to search on a large table for the right person as they arrive. With InVentry, the system looks after it all for you. All you need to do is populate a database with the expected attendees. Any unexpected attendees can also register on the day of the event, meaning everyone is accounted for. More than one visitor entrance? Midshire can supply and install additional touchscreens, label printers and barcode scanners that will work and sync with your central database. Most of Midshire’s offices have multiple entrances, so we’ve installed additional screens at the various entrances to ensure that every member of our staff can sign in and out correctly, without having to walk to the other side of a building to use the only InVentry sign in system.